From time to time, furries face mental health problems. But does fandom involvement hurt - as professionals sometimes suggest - or help? One man aims to find out. 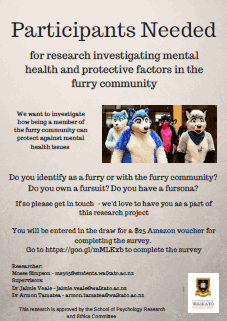 This research is seeking to investigate how members of the furry community cope with stressors and mental health issues and whether being a member of the furry community can be a protective factor against stress. We also want to investigate how a person’s fursona/furry identity and their actual identity interact and any differences/similarities between them. The research is being conducted by Moses Simpson, a Master's student at the University of Waikato. While questions about fursonas are included, any resulting discussions are to be limited to general trends due to concern over identifiability. The survey should take less than an hour. As a bonus, participants (16+ only) may enter a drawing for one of three US$25 Amazon vouchers. Preceding research: Survey suggests furries 'think differently', but aren't crazy (by the ARP). One of the questions was worded so poorly that I wasn't sure what it was asking, but I forgot to save it and can't remember it now. The one used by Heat Street when covering the child abuse case in Bucks County. I just went to Google's image search and found it to be the top result when doing a search for "furries". Others' results may vary but this is possibly how unrelated groups are arriving at that photo and using it.